In the competitive world of hiring and recruitment, well-crafted job descriptions serve as your first lines of defense when trying to lure in prospective candidates into your company. On many occasions, your job descriptions that you post in your online and print media will be your chance at casting a good first impression as a company. It’s more than just maximizing SEO and standing out in a list of search results. It’s about casting your company in the right light. It’s about sending a message as to what direction your organization is planning to take and how your prospective recruits can help further your company’s interests. 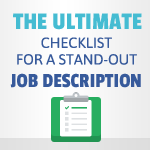 Here, we’ve crafted a simple and easy-to-follow checklist that your company can use to craft out a perfect job description that is sure to impress your prized recruits. Your Company’s Name and Logo – Always start with the obvious: Your company’s name and logo. In the world of recruitment, never underestimate the power of name recall. Be confident and advertise your brand with pride. You worked hard to build your brand and your applicants should know that you are proud of it. Company Background – You don’t have to go into full detail with regards to your company’s history or the nature of your business. Although, a little insight as to how your company conducts itself can go a long way in acquiring the trust and interest of prospective recruits. Location of the Available/Vacant Position – You won’t want to lead any applicants on. Be upfront and set things straight by displaying the exact location of the office/workspace in which the applicant will be working in should he be accepted. If a particular job is available in various locations, it’s best that you be transparent and list them all at once. It makes things easier for the applicant during the hiring process and they will truly appreciate it. Overview of the Job/Details of Workload – Indicate here the full and accurate details of the workload that you expect of your applicants once they are hired. Explain the position’s responsibilities and the core competencies needed to fulfil the various tasks that the job entails. It’s also best that you provide a concise description as to how that particular position impacts the overall flow in the company’s business processes. Applicant Requirements – In order to weed out the pack, you might want to consider setting various requirements that candidates must have satisfied prior to their application. Basic requirements like educational attainment and work experience often serve as good benchmarks for selecting quality candidates. Job Type – Indicate the nature of the applicant’s employment: Full-time, Part-Time, Contractual, Internship, etc. Compensation – Most companies choose not to advertise how much they are willing to pay for their employees services. However, applicants are often lured by transparency especially in terms of the company’s financial compensation. If you are still hesitant, perhaps you can choose to be a little flexible by displaying a range of possible salaries that employees might be able to attain. Application Details/Instructions – This is probably the most important part. You’ll want to clearly lay out all the instructions for the applicant to follow smoothly and easily to ensure that he/she won’t see the application process as a hassle. If possible, write it in a step-by-step manner that will be easy enough for an 8-year old to read and understand. Indicate the proper forms that need to be filled out, the steps that the applicant must go through, and other required details. Incorporate Photo/Video In Your Job Description – In the advent of the internet and social media, pure text-heavy posts are becoming obsolete. Maximize the resources offered to you and make use of graphics, posters, photos, and videos in your job description. This will surely make your ad stand out and it can also entice applicants to pass it around to their colleagues. Text-heavy job descriptions can often appear too traditional, dull, and boring. Liven it up and add some color and vibrancy. Don’t be afraid to make use of multimedia! Embrace it! That should do the trick! These are the very basic bare essentials that you need. Just follow this checklist when drafting your job description and you’ll be sure to come up with a quality job posting. Applicants will be trickling in one by one in no time!